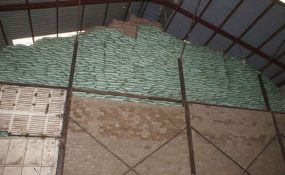 Suspected contraband sugar in Nakuru. Members of Parliament have resolved to indict two Cabinet secretaries and a number of parastatal heads for endangering the lives of Kenyans by allowing 'poisonous' sugar into the market. Members of the National Assembly Committees on Agriculture and Livestock and that of Trade, Industry and Co-operatives want Cabinet secretaries Henry Rotich (Treasury) and Adan Mohamed (Industrialisation, recently moved to East African Community) held culpable for their actions that saw the entry into the market of the sugar, feared to be laced with elements of heavy metals -- mercury, lead and copper. The 38-member committee, currently in Mombasa for report writing, was initially split in the middle on who should carry the cross, with some defending the Cabinet secretaries and instead putting the blame on parastatal heads. However, threats of a dissenting report forced the other members of the joint committee, co-chaired by Mandera South MP Adan Ali and his Kieni colleague Kanini Kega, to endorse the recommendation. "We have agreed to indict the CSs and the parastatal heads as well as recommend that they be investigated further by the responsible government agencies for failing to perform their duties," a member of the committee said. The committee also wants the management of Kenya Bureau of Standards (Kebs), Kenya Revenue Authority (KRA), Sony Sugar Company Ltd and sugar directorate at the Agriculture and Food Authority (AFA) to take individual responsibility for failing to perform their roles effectively. The probe was in response to Samburu West MP Naisula Lesuuda's request for a ministerial statement on whether sugar in the market is safe following claims by Interior Cabinet Secretary Fred Matiang'i that it contained traces of heavy metals. This came as it emerged that Kenyans will wait longer to know the results of whether the sugar is safe or not after Mr Kega said the committee will file its report without conclusive findings from the Ministry of Health, Kebs and the government chemist. "The 10 days that the Speaker gave us are now over. We have also concluded our investigations but the challenge we have is that the government agencies have been unable to provide us with their final results on the suitability of the sugar," Mr Kega said. Mr Rotich is on the spot over the three suspicious gazette notices he issued in the importation of duty-free sugar last year. In the gazette notice number 4536 of between May 12 to August 31, 2017, Mr Rotich did not specify the quality and quantity of sugar to be imported despite his Agriculture colleague, Mr Mwangi Kiunjuri, advising so. The notice also permitted everyone, including those not licensed, to import the commodity thereby compromising quality and standards. Kebs on the other hand failed to ensure that quality standards are adhered to. KRA has been accused of failing to implement the report of the 11th Parliament. The report recommended that KRA forms a multiagency with AFA and DCI to check the porous border points where contraband sugar was entering the Kenyan market. The committee is expected to finalise its findings and recommendations this morning before presenting the report in the House tomorrow when MPs resume sittings after a short recess. The CS also intervened and issued a gazette notice to allow 14 companies that had imported outside the duty waiver period to have their consignments cleared by KRA without paying the import duty. The notice number 9801 had extended the duty waiver period from August 31 to December 31 but would later be amended by another issue of notice number 10149, which reduced the December date to October 13. But still, the private firms would still have their consignments delivered in December duty-free. The CS is also on the spot for failing stop companies that had been blacklisted by the 11th Parliament. KRA was also required to punish its staff who aided in sugar smuggling business but KRA Commissioner General John Njiraini defended them, saying they did nothing wrong. AFA is accused of failing to ensure that quality and quantity measures were adhered to when the sugar was imported. Sony sugar has been indicted for being used by private entities to import the 'poisonous' sugar as well as a conduit to evade import duty. The recommendations will put the multiagency team from the Director of Public Prosecutions (DPP), Ethics and Anti- Corruption Commission (EACC) and Directorate of Criminal Investigations (DCI) on high alert. In its preliminary findings of sugar seized by the joint team and that in the market, the Ministry of Health told the committee that it had not found traces of heavy metals as claimed but high moisture content, moulds and yeast in the 174 samples tested in selected parts of the country. It was a similar case for Kebs as its acting managing director Moses Ikiara said that also traces of copper and lead had been discovered in two samples of the commodity seized in Eastleigh and Ruiru, currently detained at the DCI, Nairobi. The committee members will be seeking to clear their names after their July 5 preliminary report was dismissed by Speaker Justin Muturi, Majority Leader Aden Duale and Minority Leader John Mbadi as being inconclusive.